Supercorazón is an exemplary guide to the basic everyday action we must take to enjoy excellent health. Doctor Caralps, who carried out the very first heart transplant in Spain, explains how the heart works and how to take care of it. Some of the subjects addressed in Supercorazón are the dangers of cholesterol, sugar and salty foods, circulation, heart attacks and chest pains, artery hypertension, tobacco, stress, alcohol consumption and basic physical exercise. 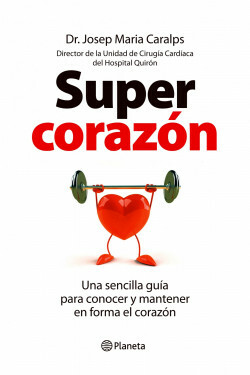 Supercorazón clearly and precisely explains in a simple and friendly manner what the heart is, how it works, why it gets sick and how to avoid this happening prematurely. Everything you need to know to keep your heart in shape: how it functions and how to prevent damage. Doctor Caralps is a hugely respected medical figure, the head of the Cardiac Surgery Unit at the Quirón clinic who is best-known for being the person who carried out the first successful heart transplant in Spain 25 years ago.